Materials Of white opaline glass and colored enamels. The ovoid body mounted by a flared neck and supported by a socle resting on a square plinth. 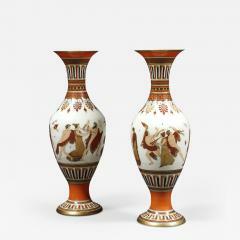 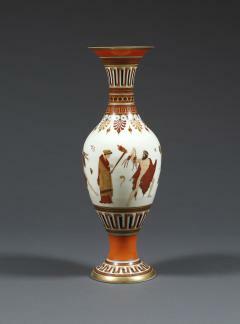 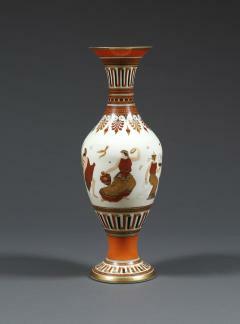 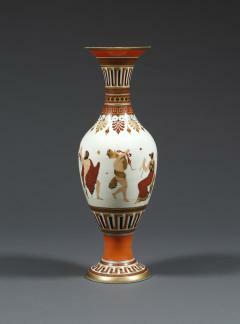 The neck and foot of each vase decorated with registers of greek key and other geometric designs, the shoulder decorated with alternating anthemion and lozenge motifs, and the body of each decorated with different vignettes depicting classical male and female musicians and dancers.